When was the last time you screamed with joy so hard because of a once in a lifetime opportunity that best describes your passion and your lifestyle? I mean, who would say no to Shopback Philippines' search for a Chief Shopping Officer whose job is to shop all her heart's desires online worth Php 100, 000? I live online, like I'm in front of my laptop or holding my smartphone 10 hours every freaking day. I am a blogger who needs to be updated of what's the buzz in the blogosphere all the time. I am also a full time digital marketer for an offshore brand who needs to be connected with my colleagues living on different time zones. I am a traveler who are always on the go - booking flight tickets, accommodations and travel essentials whenever I need to! I am a woman who loves to shop, get pampered, and craves for that retail therapy every once in a while. This made me reminisce what I have been purchasing online recently. These are mostly my life's necessities and not just wants anymore. I have been using the online world not only to take advantage of faster turnaround but it has made my life much easier than before. Because of technology, buying a thing or service won't need a person go to the physical store to get it. This is such a blessing for those like me who are always busy and multi-tasking individuals. My Cherry Mobile phone, yoga mat, and Canon EOS 12D SLR camera are all purchased online. My flight tickets to Hong Kong, Cambodia, Indonesia, Palawan, Cebu, Dumaguete, Caticlan, and a lot more are all booked online. My original Victoria Secret perfume, some lipsticks, staycation to Hotel Jen Manila and a pampering session with Blueday Spa are all made possible through my laptop. While the one-minute video application can't say all of what I want to say, I would like to share my complete answers for these questions below. 1. What are the interesting fact about yourself? I'm a blogger for 7 years working with different brands through article writing, social media posting, and event launching. 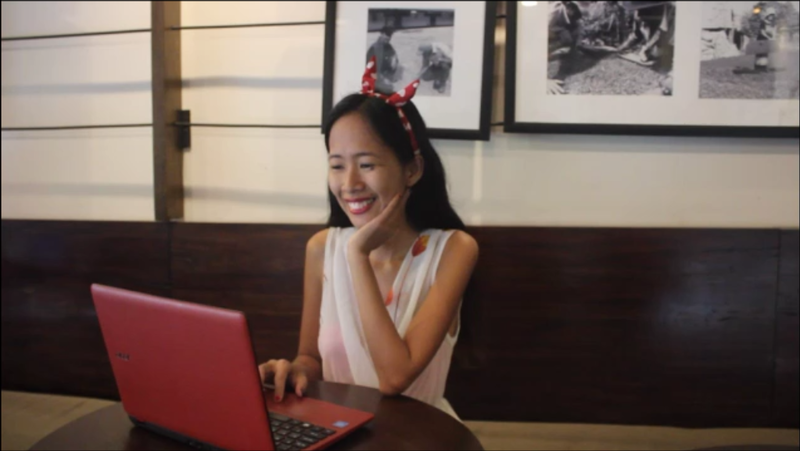 I'm also the content curator and social media manager of a chain of hostels in Cambodia, Philippines and Thailand. I do my tasks remotely so basically, I am always online whether I like it or not to get things done. Offline, I am a budding yogi and cook. The moment I wake up, within an hour I should be drinking hot coffee and going online. If not, I think I will die if I don't get to do these. I can talk for hours about travel. NO, it's forever. I love to travel. I'm in love with the idea of going to new destinations for the first time, chatting with the locals, eating the local food et cetera. My biggest chunk of online purchase are flight tickets and hotel accommodations. 2. What are your three reasons why you want this job? a) I AM AN ONLINE GEEK! I love to share good vibes to everyone. You can check Facebook and Instagram. I enjoy being photographed, taking pictures and doing videos. I know I can encourage if not educate people about shopping online the right way. I love working with brands. I have been collaborating with a lot of brands because I am blogger so I am used to the responsibilities and duties of what a Chief Shopping Officer should be. It won't be hard for me to adjust. c) Who wouldn't want free shopping? That means some serious shopping on the way. Awesome right? There's so much to buy in my shopping list! An underwater camera, a pair of ballet shoes, new mobile phone, a set of make up kit, jeans, dress et cetera. I have some trips coming soon so I will need to book flights and hotels as well! This Php 100, 000 can tick off every single things in my bucket list! 3. Why should we hire you? It's my dream to become an ambassador of a brand that is aligned with my beliefs in life. Being a Chief Shopping Officer is not just about going on a shopping spree but also to be the face of Shopback. I want to share to everyone my tips and tricks on how I find the best shopping deals online like using Shopback because for every purchase there's literally a cash back. Most of all, I want to inspire everyone how to shop responsibly as well.